I see the camera! That means it's treat time! What dog wouldn't love a job that requires them to eat treats? BOL!! My pals at Loving Pets understand that we love delicious meaty treats. They also know our humans want the treats to be healthy. 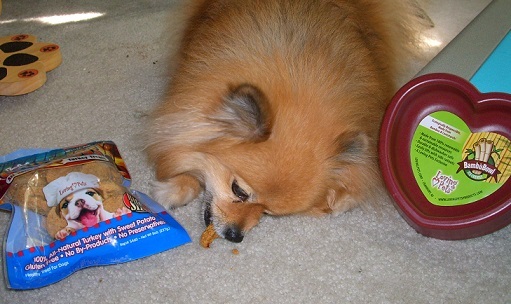 Loving Pets has a new treat line called "It's So Natural". They asked me if I would like to try some. Naturally I barked "yes"! 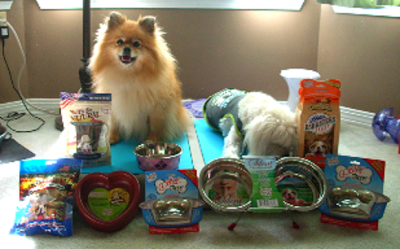 Loving Pets sent 3 types of delicious treats for me to taste. They also included some bowls for me to eat the treats in. Mom says the bowls are not only for treats, they are for food and water too. I'll try to convince her they are really for treats. BOL!! They arrived with treats, so that means they are for treats! Right? As usual, Mom had to read all of the ingredients, and see where the treats were made before she would open them. 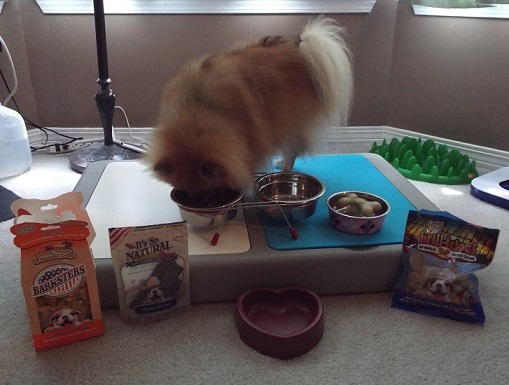 I am happy to woof that all three of the Loving Pets treats I received are made in the USA with ingredients grown in the USA! High Paw! They are gluten & wheat free, no preservatives, no by-products, and no additives. All of the ingredients are recognizable. I listed the ingredients for each treat so you could see for yourself how natural they are. They all passed Mom's inspection. Pawsome! Let the tasting begin! Pure beef! I love it! I wish Mom would let me eat a whole one! The Jerky bars are over 5 inches long. Mom breaks them in half for me because I am a little dog. I tell her I can eat a whole one, but she still won't give it to me. She keeps telling me I can't have my entire daily calorie allowance in treats, that I have to eat some of it in dog food. I disagree. BOL! 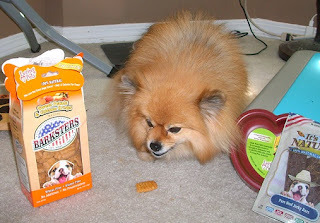 Barksters Sweet Potato & Chicken Krisps ingredients: sweet potato, rice flour, chicken, and rice bran oil. Barksters Treats are air puffed to make them crispy. These low fat treats have only 12 calories per treat. That's pretty good for a treat that is over 2 inches long. For me, these are big treats! Mom even lets me have a whole treat at once! Yum! Grill-icious! I think the name says it all! Let's be honest, dogs love grilled meat! BOL!! These healthy treats are actually grilled! They are cooked on grilling racks to reduce fat and enhance flavor. These burger shaped treats are furrific! May I have another one pawlease? Do you shove your bowl around? Do your humans appreciate the music you provide at dinner time? You know the song - clang, clink, rattle, rattle! 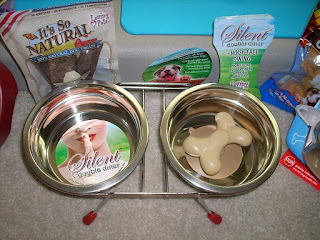 Loving Pets has designed the Silent Double Diner to silence the dinner time concert. Apparently, not all humans have the same taste in music as their dogs. BOL!! The delicious sounding rattle of a metal bowl does not always please the human ear. The Silent Double Diner has rubber rings to prevent the bowls from clanging around in the frame. The rings are removable so you can put the stainless steel bowls in the dishwasher. The frame has rubber feet to prevent the diner from sliding. The Silent Double Diner is available in 3 colors and 4 sizes. I have the 1 quart size in red. I have bowl shaped like a heart!! It is a Bamboo Bowl from Loving Pets. The Eco-friendly Bamboo Bowls are recyclable, biodegradable, and dishwasher safe. I think it is furrific to have a heart shaped bowl. Pawsome! Loving Pets sent me the cutest little pink bowl! 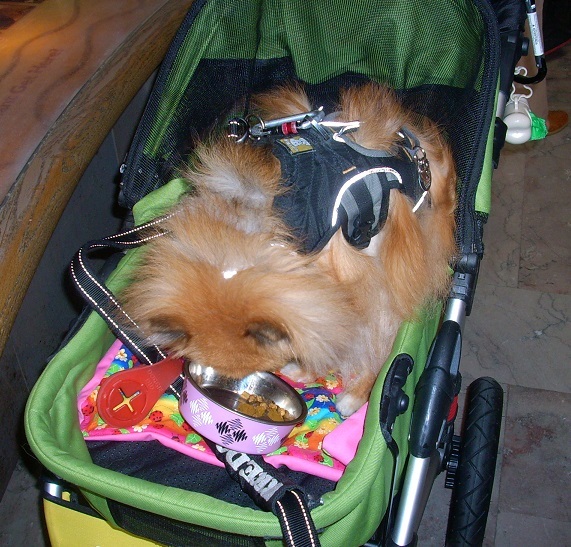 The pint size designer Bella Bowl is the pawfect size for my stroller! I propped it up in the photo so you could see the pretty argyle pattern. Bella Bowl is available in a variety of different patterns and colors, so you can find one you like, I chose pink of course. BOL! There is a rubber ring on the bottom to prevent the bowl from sliding around the floor. You can remove the rubber ring when you want to put the bowl in the dishwasher. Bella Bowls feature a stainless steel interior, and are available in 3 sizes for most of the designs. What's that thing in my bowl? It's a Gobble Stopper! The Gobble Stopper slows down fast eaters. It can be used in any bowl with a flat bottom. 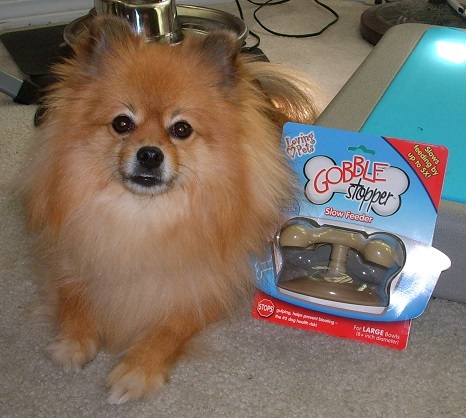 The Gobble Stopper attaches to the bottom of your bowl with a suction cup. It is available in 3 sizes. The medium size fits most of my bowls. 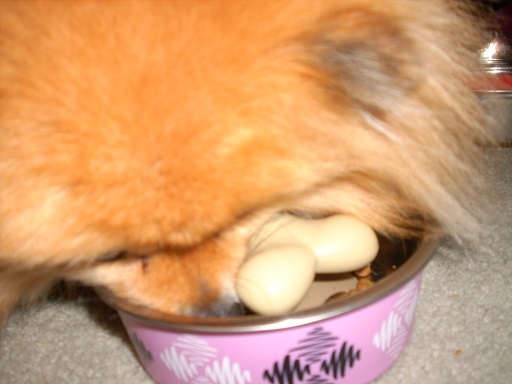 The bone shaped obstacle forces you slow down when you eat. You can't reach all of the food at once. You have to eat around the Gobble Stopper, moving your snout from one side to the other. It has put an end to my days of sucking up food like a vacuum cleaner. BOL!! Now that I have slowed down my eating, I am actually chewing my food instead of swallowing it whole. I am giving away this large Gobble Stopper! Log in to the Rafflecopter for entry options. Giveaway Disclaimer: I did not receive any monetary compensation for this giveaway. I was given a free product to give away. The opinions in this giveaway are my own and not influenced by any outsider. I am not responsible for lost prizes. I receive no additional benefits for talking about the product or company. Why would you want to slow down the eating when you have such yummy treats? I inhale mine and can see why you would, too. Grilled food rules, especially beef!!! I love to carry my stainless steel bowls around and bang them on the walls so Mom knows to fill 'em up. BOL!! I haven't tried to carry any of my bowls! I have pushed a few across the floor while licking them clean (no rubber/nonskid bottom on those) BOL!! 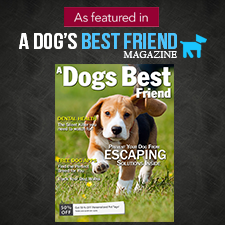 great review there - they do like like tasty treats and we have those bowls! Kouga eats slow, but Artie gulps his food so fast, I'm afraid he is going to choke. We have a raised feeder for our dogs' bowls. Both dogs love grilled food, and salmon is a favorite. Oh my! Choking is scary! I gag if I try to eat and bark at the same time. Great review! I eat just right; not fast, not slow. I LOVE grilled food, particularly chicken. I have a small stainless steal bowl. That is pawsome to hear Nola! High Paw! Sometimes I gobble and want more cause the others are still eating. This would help ma a lot Pepper! We have stainless steal bowls in wooden stand's. Oh wow! Competitive eating! I think many of us eat faster when another pup is close by. I know I taught Baron to eat faster. BOL!! All of this stuff looks so cool Pepper! Especially the raised food bowls with rubber stoppers on them. I am trying this again. I typed my comment hit the publish it gave me message and did not post. Oh Pepper, another FABulous review!!! I do loves the natural treaties! And jerkys are my favorite!! I do loves the pink bowl! I sometimes eat special treaties out of the bowl, and I, too, do not understand why all our calories cannot be treaties!! Pfffffft! Hi Ruby! I totally agree with you! Treats are the best! 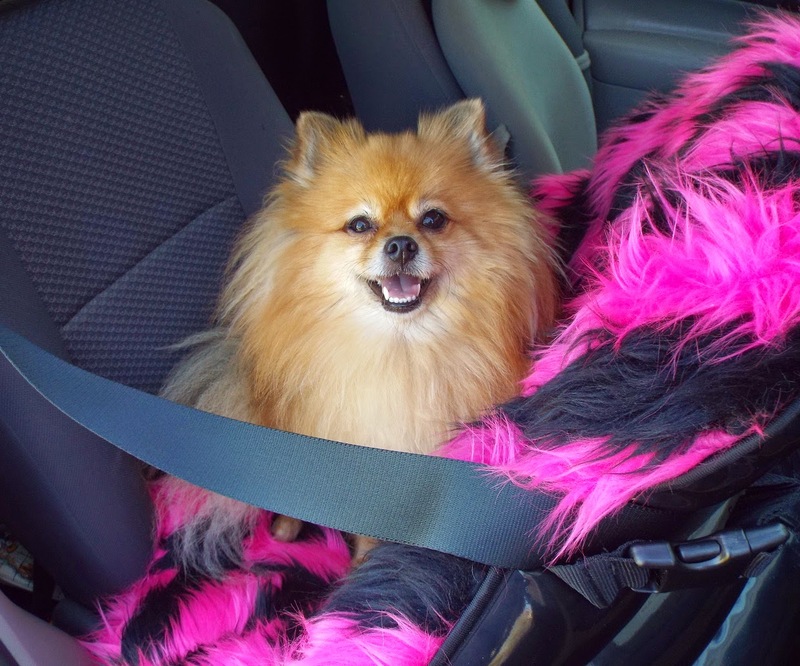 You know I adore pink! BOL!! OOOoooo!! I love jerky!! 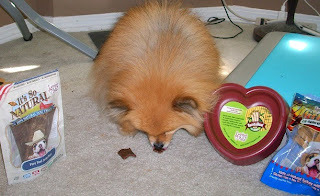 USA jerky is hard to find, so glad Loving Pets makes some! BOL!!! 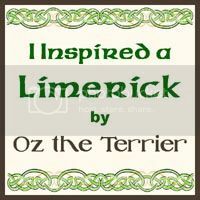 You are such a total terrier Oz!! Pushing a rubber bottom bowl! High Paw! BOL!! I don't normally get treats in bowls, but I sure wish I did! BOL!! Ooooo. I like the gobble stopper. I may need to order three of those to use for my teenagers! The treats all look like fun! BOL!! I hope your teens are furry ones! 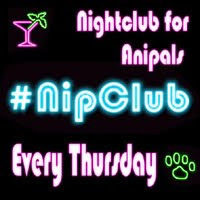 *Pepper imagines human teens served supper with Gobble Stoppers* ROFBOL!!! oh i scarf the food! My dog eats slow.unless it's ppl food. In that case he scarfs is down. And yes he likes grilled food. My dog eats a little to fast.. He eats a bit then runs around and starts eating again. When he's done he always thinks his bowl is a toy, and he begins to play with it. Nesbitty things this looks good! She'd eat it very fast. Her brother Slater would eat it faster (he's about 50lbs bigger than she is lol). Keep up the good work Pepper! My dogs eat fast but telling my gang to slow down is useless. :) Thanks for the chance to win and good luck to all.